One of the city's most fabulous buildings, the Pythian is richly decorated in brightly colored, glazed terracotta embellishments depicting figures of antiquity. It was designed by Thomas W. Lamb, one of the country's foremost designers of movie palaces, most of which, sadly, have been destroyed. One of his other works in New York is the Audubon Theater and Ballroom building on Broadway and 165th Street. 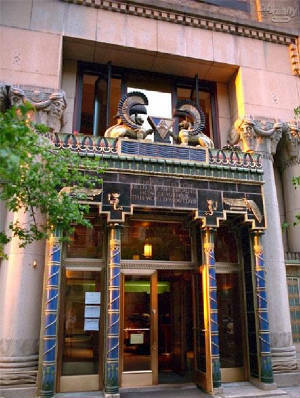 It was built in 1927 to serve as a meeting place for the 120 Pythian lodges of New York City. As the organization's popularity declined, the Pythians leased space in the building to Decca Records. In 1954, Bill Haley and His Comets recorded their album Rock Around the Clock at the Pythian in 1954. Other artists who recorded there include Buddy Holly, Sammy Davis Jr., and Billie Holiday. Days after the brutal Soviet suppression of the Hungarian Revolution of 1956, noted actor and Communist Party activist Paul Robeson spoke at the Temple. He, audience members, and a number of Pythians who had not attended the speech were pelted with eggs and fruit by angry demonstrators as they left the building. In 1958 it was purchased by the New York Institute of Technology as that college's main campus. It was converted to a condominium in 1983 and contains 84 residential apartments. The conversion and restoration, designed by David Gura, altered the building's largely windowless facade by inserting many new windows, but it managed to retain most of its exuberant decorative features. Each apartment is different and there are four professional offices on the ground floor. According to architect David Gura, "the building was intended to be the regional meeting facility for the lodges of the Knights of Pythias and as such it housed several stacks of windowless lodge halls, each one complete with ancillary rooms and an organ loft." "This pile of meeting rooms was suspended above the column-less auditorium, which occupied the entire third floor by two enormous steel plate trussses, two stories tall," according to Mr. Gura. "New duplex apartments were threaded throughout the old trusses and inserted between the existing floor slabs. New floor slabs trisect the old auditorium space. New windows were added in a manner thar reveals both the original construction and new renovation. Gold reflective curtain wall with deep red-colored framing members are split at the fifth floor, providng terraces for bedrooms on that level and showing both how the mass above is suspended on trusses and how the original five-bay architectural facade was overlaid on a six-bay structural frame," Mr. Gura has noted. Some decorative elements that were removed from their original positions were salvaged for use elsewhere within the building, whose renovation won a residential design award from the New York Chapter of the American Institute of Architects. Singer/songwriter Stefani Germanotta, better known by her performing name Lady Gaga, grew up in The Pythian where she once lived and attended Convent of the Sacred Heart School, the same private all-girls school attended by Paris Hilton and her sister Nicky. 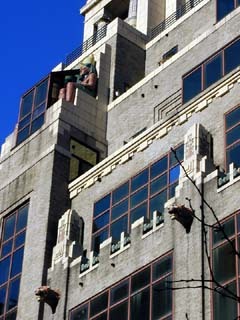 The Pythian ranks with the gargoyle-strewn Westside YMCA on 63rd Street west of Central Park West and the former Shelton Hotel, now the Marriott Marquis New York, on Lexington Avenue at 48th Street, at the top of the city's list of surprising and delightful buildings. It also serves as a good reminder that sculpture in antiquity was often brightly painted.